Our gold Count Your Blessings necklace will be treasured for generations. 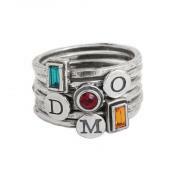 Customize with 2, 3, 4, 5, 6, 7, or 8 birthstones of those you love. 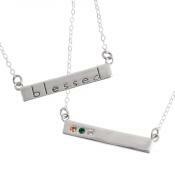 The word "blessed" is engraved on the back of the necklace for added meaning. The simple bar necklace can be seen in fashion magazines on on celebrities. 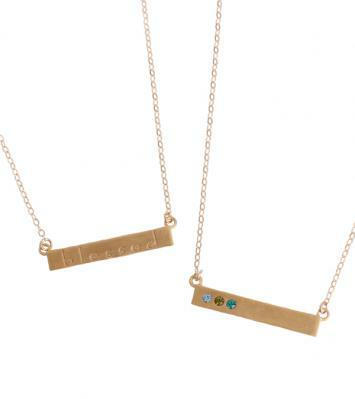 Nelle and Lizzy's birthstone bar necklace takes the concept a bit further. 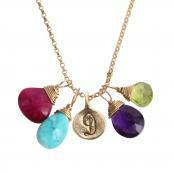 Birthstones add meaning to this simple and sophisticated design. To top it off we added the word "blessed" to the back to remind you of how blessed you are. How many blessings can you count? On this simple necklace you can count up to eight kids or all the members of your family! Each birthstone can represent someone you love. You can put just the birthstones of your kids or grandkids or you can include mom and dad too. The listed price is for 2 stones. If you want more stones the price will increase. The necklace is available in 16" and 18". The chain is gold filled and the birthstone bar is 14K gold vermeil. The birthstones are Swarovski crystals. All sales are final. We only use sterling silver, 14K gold, gold filled or 14K gold vermeil in our products. I am so in love with this precious, sentimental gift!! It is the most beautiful thing ever. The process to purchase the item was simple and perfect as well. I loved the packaging for the item as well...maybe minus the filler bomb hahaha. It's so beautiful. I purchased the gold bar necklace for my daughter in law and she loved it. She took on two great nieces to raise and I included them on the bar, which really touched her heart. She is a wonderful wife and Mother, so thank you for making her happy!